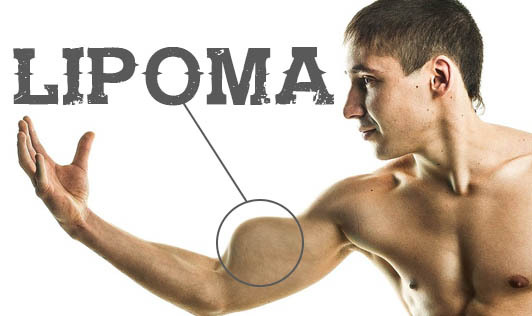 A lipoma is a slow-growing, fatty lump that is located between one's skin and underlying muscle layer. Lipomas can occur at any age but are often detected during middle age and can form on any part of the body. They typically appear on the shoulders, neck, back, abdomen, arms, and thighs. Lipomas are not cancerous and are usually harmless, but if a lipoma happens to be painful or growing, one may want to have it removed. The cause of Lipoma is unknown, but it tends to run in families and genetic factors are likely to play a role in their development. Other factors such as being between 40 and 60 years of age and having certain disorders such as Adiposis dolorosa, Madelung disease, Cowden syndrome, and Gardner's syndrome also increases one's risk of lipoma. Lipomas are seldom a serious medical condition. However, if you notice a lump or a swelling anywhere on your body, please have it checked by your doctor!